Parliament deputy speaker Wan Junaidi Tuanku Jaafar revealed today that he was once approached by Parti Keadilan Rakyat (PKR) to cross over to the party. According to The Borneo Post, the Santubong parliamentarian said a few PKR members approached him in Kuching several days after the federal cabinet was announced in March. However, the politician disappointed the opposition party by expressing his loyalty to Barisan Nasional. “I also told them that I did not believe that other Barisan MPs would be willing to cross over to PKR to form the federal government with a simple majority. “Why should 30 or so MPs cross over to the PKR just for the sake of forming a government with a slim majority? 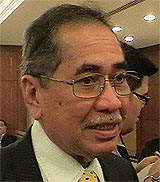 “The BN has already formed a strong government though eight seats short of a two-third majority,” he was quoted as saying. The Parti Pesaka Bumiputera Bersatu (PBB) supreme council member said the coalition’s failure to secure a two-third majority in Parliament following the results of the March 8 general election should not be considered as a drawback. According to him, the two-third majority was only useful when enacting and amending constitutional laws as other laws could still be passed even with simple majority.